In our last expedition, we were anchored pretty close to our daughter’s house in a coastal suburb near Wilmington NC due to our child-care responsibilities. Every time we go down I say I’m breaking free to find the nearest coastal nature or wildlife preserve, but I have so far failed to put sandals on that notion. So at least I would put my new Canon Powershot G7X through its paces, home-bound as I was, and with the unwelcome addition of a bout with subtropical depression. Her name was Ana. 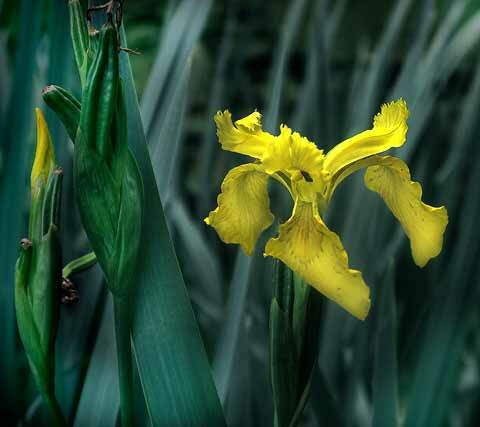 About the subject: Pale Yellow Iris, aka Iris Aquatica. Iris lutia. Yellow Flag. Yellow Iris. Fleur de Luce. Dragon Flower. Myrtle Flower. Fliggers. Flaggon. Segg. Sheggs. Daggers. Jacob’s Sword. Gladyne. Meklin. Levers. Livers. Shalder. Or Iris pseudacorus, if all the common names have your head spinning. The challenges were many. This plant grew beyond the wire fence that actually runs down into the wetland waterway behind the house, so I could not get any closer than about five feet from this one surviving bloom among its spent siblings. The G7X max optical zoom is 100mm and that’s where this image was taken, as I recall. The sky was forbiddingly dark and the frontal winds before the approaching storm where whipping these five foot tall leaves and flower stems such that at least a 500th second shutter speed was required, I thought. So I’m happy with the camera whose ergonomics fit my hands better than the Panasonic Lumix LX7 that my buddy Ed in Roanoke is now using mostly for its excellent macro function. Happy shooting, all! Too bad you couldn’t find a more easily accessible flower to photograph. Did you drive through Raleigh? Nice shot, but what I really enjoyed was learning all the common names attached to this one plant!! Fliggers indeed.